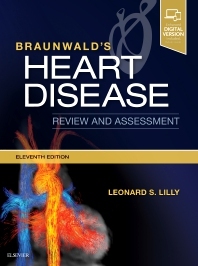 With more than 700 review questions derived from and keyed to the newly revised 11th Edition of Braunwald's Heart Disease, Braunwald’s Heart Disease Review and Assessment, 11th Edition, is the perfect review tool for fellows, residents, and practitioners to prepare for board exams in cardiovascular medicine. Noted Harvard educator Dr. Leonard S. Lilly, with assistance from faculty and fellows at Brigham & Women’s Hospital, provides a thorough, clear, and concise overview of the entire field, helping ensure your mastery of all key aspects of today’s cardiology. This title is a one-stop resource for complete, authoritative coverage of the most important concepts in cardiovascular medicine – ideal for self-assessment, individualized study, and clinical practice.